The German government on Friday reached agreement on a long-delayed plan to drastically reduce greenhouse gas emissions by 2050, clinching a deal ahead of next week's high-level global climate talks in Morocco. The agreement ends months of bickering in Chancellor Angela Merkel's left-right coalition and spells out CO2 emission reduction targets for all the country's economic sectors, although those for industry were watered down in the final version. "We have found a good and balanced solution," said Vice Chancellor and Economy Minister Sigmar Gabriel, who had notably held up the deal with his insistence on concessions for the brown coal, or lignite, industry. Cabinet ministers are to formally approve the so-called Climate Action Plan 2050 on Monday, sparing Environment Minister Barbara Hendricks the embarrassment of turning up in Marrakesh for UN talks on limiting global warming without a clear pledge from Europe's top economy. The German targets are meant to help the country live up to its commitments under the Paris Agreement struck last year, the world's first universal climate pact which aims to cap warming to under two degrees Celsius (3.6 degrees Fahrenheit) over pre-Industrial Revolution levels. The German deal lays out concrete steps for how the nation plans to turn away from fossil fuels and cut emissions by 80 to 95 percent by 2050 compared to 1990 levels. 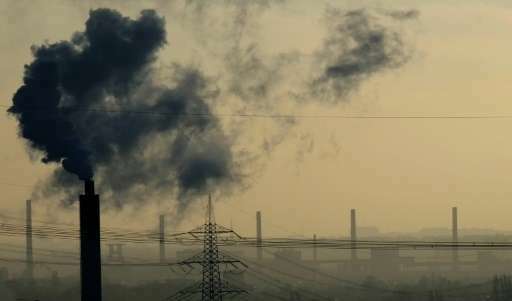 The industrial sector will have to lower its CO2 emissions by around half to between 140 and 143 million tonnes by 2030—some 10 million tonnes more than was proposed in earlier versions of the text, DPA news agency reported. Gabriel said the plan now also foresees the creation of a fund to assist regions hit by job losses as a result of the shift from coal-fired power generation. Some campaigners criticised the plan as light on detail and too business-friendly. "A missed opportunity," was the verdict of Eva Bulling-Schroeter, environment spokeswoman for Germany's far-left Die Linke opposition party. "This plan clearly shows how deeply embedded the industry and energy lobbyists are in the economy ministry," said WWF Germany's climate and policy director Regine Guenther. Diplomats from 196 nations are meeting in Marrakesh this week and next for talks on how to implement the Paris treaty. The gathering has been overshadowed by fears US president-elect Donald Trump will follow through on a campaign pledge to "cancel" the pact.